Sometimes packing food in a small lunch storage box can be less and keeps your kid hungry after the lunch break. 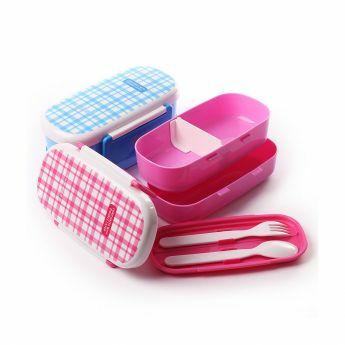 That is why you need to look for food storage boxes that can pack more food and the plaid double layer lunch box will be an ideal choice for you. It comes with double layers to enable you to pack more food and also pack different kinds of food like packing rice and vegetables in the bottom and fruits and nuts in the top layer. And even the top layer is divided into two compartments so that packing different snacks is easy and ensures that they don’t get mixed up. The stylish double layered lunch box is made using high-quality plastic and comes with easy to lift latches on the side that enables your kid to easily open and close the box. The safety snap latches also ensure that the food packed is completely safe as it is 100% leak proof and hence you don’t need to worry about any leakage. 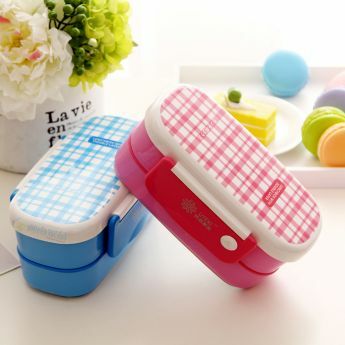 It is one of the best double layer lunch box that is also perfect to carry it along with you for picnics, office, and school. It can also be used a storage container and can be refrigerated as well. The eco-friendly food keepers are completely dishwasher safe and hence cleaning the box is easy. The plaid double layer lunch box comes in two different colors including blue and purple and also comes with an attractive design. The lunch box is made using top quality food-grade materials and is completely eco-friendly. Since it is lightweight, it is easy to carry it along with you wherever you go.